Guitar Center has fallen on hard times. According to Reuters, American finanical services company Standard & Poor's has dropped the music retailer's corporate credit rating to "CCC+" from "B-," citing struggles with "weak operating trends." S&P labeled the company's capital structure as "unsustainable in the long term." The status review came in the wake of a disappointing performance over the past two financial quarters and a "deteriorating liquidity position," none of which sounds good, to put it mildly. Back in 2007, Guitar Center Holdings Inc. was purchased by Bain Capital (yes, that Bain Capital, the private equity firm co-founded by Mitt Romney in 1984), in a deal valued at $2.1 billion. Currently, the California-based corporation holds roughly $1.15 billion in debt instruments, and also floated a $650 million term loan. Despite these figures, a source close to Bain Capital said that Guitar Center's stores remain profitable, and the company plans to open up 15 new locations this year. 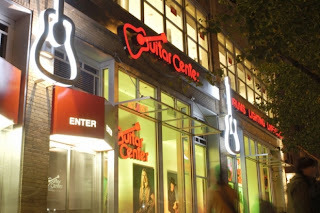 As of March 31, 2013, Guitar Center operated a total of 244 stores in the U.S. That same month, Mike Pratt was named CEO after growing Best Buy Canada's total store count to 275 from 165. Based on revenue, Guitar Center currently ranks as the leading retailer of music products in the country. Earlier this year, though, Bloomberg News reported that, on the whole, the chain is losing money for Bain. 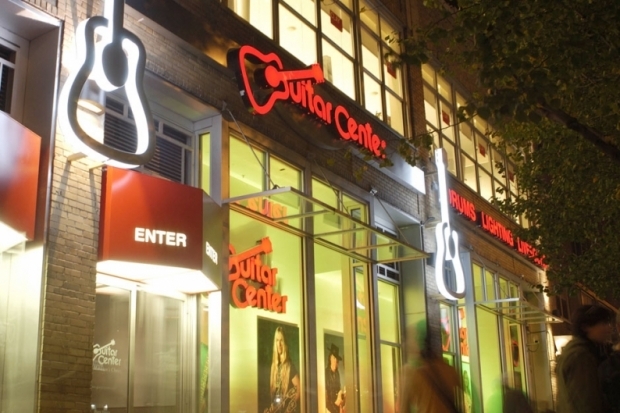 Standard & Poor's said that Guitar Center's management will spend the next year focusing on strengthening the company's brand and improving declining sales. "However," S&P said, "we anticipate only modest profit gains during 2013 given our view of the increasingly competitive landscape and persistently challenging macroeconomic conditions in the U.S."
Recently, employees at Guitar Center's flagship store in Manhattan voted to unionize in an effort to improve working conditions and declining wages. As Rolling Stone points out, the national Retail, Wholesale and Department Store Union helped 57 workers achieve the victory. The partnership begain in late 2012 after employees approached the organization with complaints of worsening pay rates, which were reportedly caused by lackluster sales commissions. Several musicians, including Kathleen Hanna and Tom Morello, signed the union's MoveOn.org petition.